An emergency Convention on the need for a second EU referendum will take place in London this coming Friday, 11 January. Organised at very short notice by Henry Porter under the banner of ‘Think Anew, Act Anew’ its aim is ambitious. A second referendum may prove to be the only way to break the deadlock in the House of Commons over Brexit. Perhaps for this very reason, many MPs don’t want it to happen, sensing that it will confirm Parliament’s unique role as our sovereign is now past its sell-by date (which many of us anyway think was 1832). But, however unlikely, a People's Vote is the only plausible way out of the immediate impasse in Westminster. It is therefore a real possibility and it would be reckless not to be prepared. For if it happens it will be the most important public engagement of our time in Britain as a whole. And it will offer a chance to bring the country together around what is best for the UK’s future and its young people. Provided, that is, it is not conducted in the same way as the last referendum. It has to be fought in a radically different manner to the 2016 vote. Certainly the so-called ‘Remain’ campaign need a positive focus on the benefits of EU membership such as free movement, as well as on the profound faults in British politics that have led to so much division and alienation. The Convention will, therefore, draw on new voices from within and outside Parliament, with a focus on fresh thinking by Caroline Lucas, who will open the day, and other high profile speakers such as Eloise Todd, Ian Dunt, Joanna Cherry, James O'Brien, Fintan O'Toole, Femi, Adam Ramsay, Laura Shields and Jarvis Cocker. To declare my interest I’ve been assisting Porter and his team and will be speaking with O’Toole and Leslie Riddoch. For me the most important thing is to show MPs, journalists and broadcasters that we can conduct a new referendum in a different fashion. They need to be able to tell the wider public that it will not be about ‘cancelling’ the last one or seeking to revert back to the status quo. There was a powerful, democratic impulse in the original vote for Brexit, which should not just be ‘respected’ it should be embraced. In this way, a new referendum and a positive vote for staying in the EU but not the Eurozone will help build democracy across the UK, not undermine it. 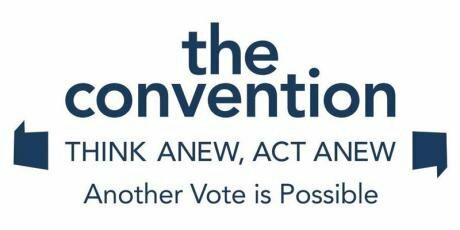 The Convention will explore how this can happen. It is surely undeniable that we need to talk and listen, debate and question, assess and prepare, and the Convention is a most welcome way of assisting this as the country moves into its greatest peacetime crisis for a century.